​and Pilates for NW Tucson! Two of NW Tucson's favorite hot yoga teachers head a new state-of-the-art hot yoga studio with lots of variations on warm & hot yoga. Diane Faircloth Van Maren and Dusty Dame, with support from a community of students who miss their hot yoga and the camaraderie of fellow students, opened a unique new facility on Oracle Rd. just a few blocks south of the former Bikram Yoga Tucson studio. Dusty Dame and Diane Faircloth Van Maren are leading a new hot yoga studio on Oracle Rd. 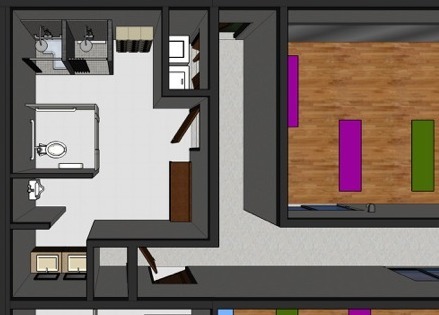 Our new studio has two separately controlled yoga rooms, both with firm and cushy anti-microbial flooring. ​Our new locker rooms make your pre & post session experience comfortable. Ample bench space and privacy entrances allow for ease of access and a comfortable environment. Our Women's Locker Room has three showers to minimize wait times. 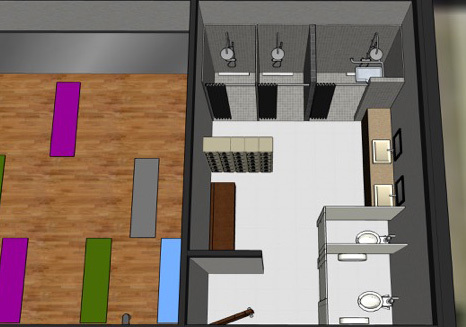 Two toilets and two sinks, along with lockers and storage spaces give you plenty of room and make the before and after class experience pleasant and speedy. Our new Men's Locker Room has two showers, a toilet and a separate urinal, plus lockers, storage facilities and benches.